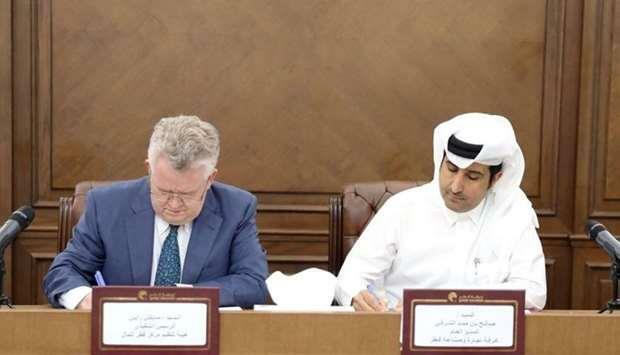 (MENAFN - Gulf Times) The Qatar Financial Centre Regulatory Authority and the Qatar Chamber of Commerce & Industry have entered into a Memorandum of Understanding (MoU) for sharing information. The MoU was signed by Chief Executive Officer of the Regulatory Authority Michael G. Ryan, and Director General of the QCCI Saleh Bin Hamad Al Sharqi. The agreement puts in place a framework for cooperation under which they will provide each other with assistance for projects of mutual interest. Both parties will join hands in exchanging information that will help in enhancing their roles in serving the national economy and the private sector. Ryan welcomed the signing of the MoU, saying: "The QFC Regulatory Authority is keen to grow and expand its cooperation with other Qatari organizations and work together in achieving common goals." For his part Al Sharqi expressed his delight with the signing of the MoU, saying: "Qatar Chamber is pleased to join hands with the QFC Regulatory Authority, which plays a key role in enhancing the business environment in the country and providing a competitive platform for firms to expand to Qatar." He added that this agreement is an important step to boost cooperation between two influential entities in Qatar's economic scene, noting that it will help both sides transfer information between them to the advantage of the national economy and the private sector.